ALMOST INSTANT, FABULOUS, CHRISTMAS PRESENT – DOWNLOAD A COVER OF A BOOK YOU CAN PRE-ORDER FROM US. ON SALE. DO IT NOW. I know we’ve sent a lot to you lately — from some reviews of heavy theology books to a few Advent devotional lists to a BookNotes feature of interesting kids books, to two long posts offering book ideas for certain sorts of hard-to-buy-for readers. We love telling you the kinds of things we stock, and of course these reviews are all archived for you to order later, if you’d like. 20% off any thing ever mentioned. And, we’re eager now to quickly tell you that you can PRE-ORDER nearly any forthcoming book you want from us. Really, we can get almost anything! Here’s a quick gift idea: you could download the cover of a forthcoming book (use a google image search or go to a publisher’s website) and wrap that up as a little card, or as a promissory note. We’ll then send that book to the address you give us, once it comes out. Easy, huh? That would be a great last minute gift; easy for you and very impressive! Almost any book that is coming out in the next few months would work; we can promise to send it to your recipient (or directly to you, if you prefer) whenever it does release. We can enclose a note saying it is from you, and even gift wrap for free, too, if you want. And we won’t even use the credit card number you give us until we ship the book, once it really comes out. Nice, eh? May we suggest that you pre-order now at least one of these three forthcoming titles? They are excellent choices for any serious reader of non-fiction. These three are among the most anticipated books of the next season, and although we could name a dozen other good ones, we’re happy to promote at least these three that we think will be just the sort many of our readers would want. We’re here to help you out, now. Download these covers, send us an order, and we’re good to go. Merry Christmas and ho, ho, ho. 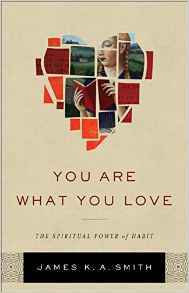 You Are What You Love: The Spiritual Power of Habit James K.A. Smith (Baker) $19.99 not yet released: DUE MARCH 2016 You may know that Jamie Smith has been one of the most talked about Christian authors of the last several years. His remarkably interesting and very important books Desiring the Kingdom: Worship, Worldview, and Cultural Formation and Imagining the Kingdom: How Worship Works have been considered to be truly ground-breaking, and widely read across the denominational spectrum. These books talk about how we are not merely thinkers — “brains on a stick” as they say — but God created us to be lovers. Minds and Hearts! We desire and love and care and serve. So Christian formation that only teaches data — Bible truths or worldviewish principles or theological doctrine, no matter how right or profound or astute — but doesn’t really shape our deepest desires, loves, priorities and such isn’t going to be truly transformative. And in fact, our Christian worship practices may be “thin” and less influential, while our secular cultural liturgies may be “thicker” and truly impact how we see and feel about the world. Those books explore deep and wise visions of spiritual imagination and how worship, among other things, effects our human flourishing and the tone of our discipleship. These two fabulously rich books will be, a year or so from now, supplemented with a crowning third volume, tentatively called Embodying the Kingdom. Here’s the thing: both of these first two were a bit academic and although they were really exciting in many ways, there were ponderous and demanded a bit from serious readers. I suspect the third will be a little scholarly, too, once it is done. However, this spring (maybe mid-March) Smith has a volume coming that will be, simply put, a more accessible summary of volume one (Desiring…) and a summary of volume two (Imagining…) and a summary of what will become volume three (Embodying the Kingdom.) You are What You Love will be an overview of Smith’s whole, big “Cultural Liturgies” project and will be a perfect way to help those who haven’t yet waded through the first two to get up to speed. Or, for those who have read the first two, and are eager for the third, this forthcoming one will tide them over early this Spring, offering a fresh re-articulation of Smith’s thesis, explained anew, and offered as a basic tool for those of us wanting to keep this conversation alive, embodying it in church and culture. This is going to be a “Book of the Year” for 2016, no doubt, so you could give it away, now. I’m sure your friend will thank you. Yes! heart of Christian formation and discipleship. Strong and Weak: Embracing a Life of Love, Risk, and True Flourishing Andy Crouch (IVP) $20.00 not yet released, DUE JANUARY 2016 Like James K.A. Smith’s named above, this is one of the most anticipated books among thoughtful and widely aware Christian readers. Mr. Crouch — who has been here to Hearts & Minds, and supports us in very nice ways — has been percolating the ideas in this book for quite a while and we trust him a lot. (We sold a book to him that pushed him further along in writing this new one) and we heard an early version of what would become this book more than a year ago at a conference in Boston. It is, Beth and I both agree, one of the books we are most eager to see, and one of the books that we are most eager to sell. I’m not kidding: Beth still has notes she took about his lecture a year ago in her purse, now, and can tell you about his chart with four options spelled out about power, opportunity, vulnerability and oppression. It certainly will (I’m just telling you now) be one of the Best Books of 2016. 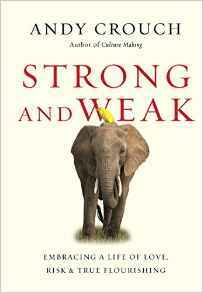 Not unlike the James Smith book above, although perhaps not so obviously, Strong and Weak is the third in what seems to be, if not a set, a series of books that nicely flow from one to the next. First, was Crouch’s remarkable — and a personal favorite — very generative book Culture Making: Recovering our Creative Calling. Since it’s publication in 2013 it has been a Hearts & Minds standard; we take it everywhere and recommend it often. Then came Playing God: Redeeming the Gift of Power, an excellent book, and a rare one, it seems, studying thoughtfully a Christian view of power, even power expressed within institutions. and how we can have a better view and engagement with authority and power. It made sense when that one came out: if we are to be culture makers, reflecting God’s image by making something of the world, using our gifts and talents to serve the common good, stewarding well all that God has put into the creation for us to explore and manage and develop, as his first one said, then — sooner or later — we are going to have to deal with institutions, organizations, leaders, and cope with the question of power. How do we get things done, and reform the world in ways that are healthy? Playing God was not really a book on leadership, although some seemed to think that. It was about the goodness of power (and the horror of it when it is abused.) Yes, to really make a difference in the world, we are going to have to be salt and light and influential leaven within systems and structures and bureaucracies; exploring the sociology of power becomes important to nearly any Christian wanting to be serious about making a God-glorifying, neighbor-loving dent in the fallen world around us. We must, as the sub-title puts it, “redeem power” and Andy tells stories from all over the world of people doing just that. I think Playing God is, to this day, one of the best books I’ve ever read and one of the ones that is woefully under-appreciated among us. This book is going to have a profound impact on our world. It’s built on a clear, deep, life-changing insight that opens up vast possibilities for human flourishing. Classic, elegant, and utterly illuminating. 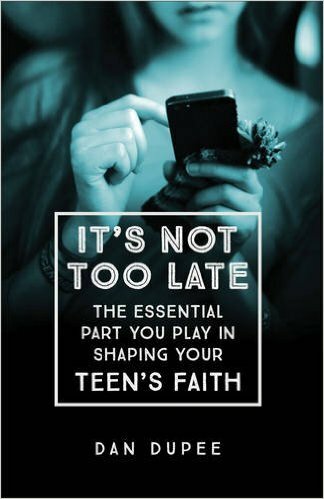 It’s Not Too Late: The Essential Part You Play in Shaping Your Teen’s Faith Dan Dupee (Baker) $15.99 not yet release DUE FEBRUARY 2016 I will be writing more about this later, but for now, you should know that this is, again, what we believe to be a groundbreaking, exceptional book. There is nothing quite like it in print, and we can’t wait to sell it once it becomes widely available this winter. I have read an advanced version of the manuscript — have an endorsing blurb on it, in fact — and am really excited to tell you about it. Here’s the short version (and why you should pre-order it now.) This is an exceptional book that is bucking the trends and assumptions we tend to have, expressed in the media, in popular culture, and even in some Christian books (I heard a person say it in the bookstore just this afternoon!) that parents of college age students don’t really have much influence anymore, that once kids reach that stage in their lives, their parents work is mostly done, and they have to hope for the best. Even in matters of faith, young adults will tend to drift from their spiritual roots, it is assumed; after high school kids will leave the church, and, at best, will come back to their faith communities, at least at Christmas and Easter. We hope that once they sow their oats, settle down, they might come back to faith in mid-life. No, no, no. Dupee knows better, and can tell you why the data suggests something very different: his research shows that parents and the local church of college age students do still have a huge role to play, and that wise parenting of teenagers, even older teens, can pay off in vibrant faith and healthy transitioning after high school into Christian discipleship in the young adult years. It’s Not Too Late explains all this in fun and sparkling prose, drawing specific principles and practices that he has learned along the way. Dupee is a down to earth guy, a dad himself (of two sets of twins, I might add) and knows well the struggles of parenting adolescents who are growing into young adulthood. He tells some great stories, too, making this a top-notch and really fascinating parenting books, more interesting and more important than most. e written a book like this, it is Dan. In his prep for this book, Dan convened numerous focus groups. (As the CEO and director of a para-church ministry that partners with local congregations near colleges, he knows churches that have good outreach to students, and knows many, many collegiates. He had ready access to lots of folks who were very willing to participant in his gathering of data.) Some of what parents and young adults said in these many face-to-face research groups is reported in It’s Not Too Late and you will be excited to learn what works (and what doesn’t) in wise and effective parenting of teens and young adults transitioning out of the house and into college or adult life. You can be confident that this is a book that is at once fun to read, upbeat and practical, and yet actually based on research, gathering of data, and lots and lots of first hand stories with students Dan has met through the CCO and their parents. It’s a treasure of a book, and we couldn’t be more happy to commend it to you. Why not order a few now. Give one as a gift, and donate one to your church library? We’ll be among the first to get them (mid-February, we’re told.) Order now at our 20% off. Spread the word: it is not to late to do what God invites us — expects us — to do: care for our young adults as they move away from home, take up their own vocations in the world, and deeper their discipleship, for the rest of their lives. This book will help. PRE-ORDER THESE NOW AT OUR DISCOUNTED PRICES. TO WHATEVER ADDRESS YOU REQUEST. CLICK ON THE SECURE ORDER FORM LINK BELOW, OR CALL US.